Google's social side is more visible every day. 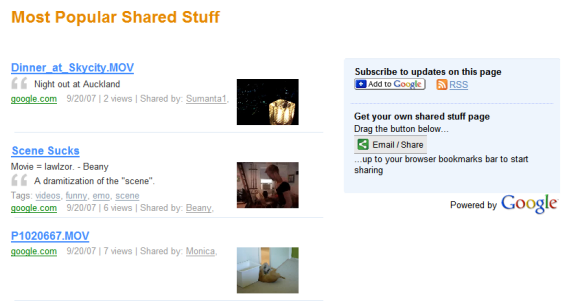 A new service called "Shared Stuff" lets you share interesting links with your friends and the entire world. You need to drag a bookmarklet to your browser's link bar or to click on the "Share" button from a web page (the button can only be found at Google Video right now). When you click on the button, a new window pops out and you can choose between posting the page to your profile, emailing it to your contacts or bookmarking the page using services like del.icio.us or furl. A profile page is public and can include information about yourself, a photo, links to your sites. You can select the photo from one of your public Picasa Web Albums. 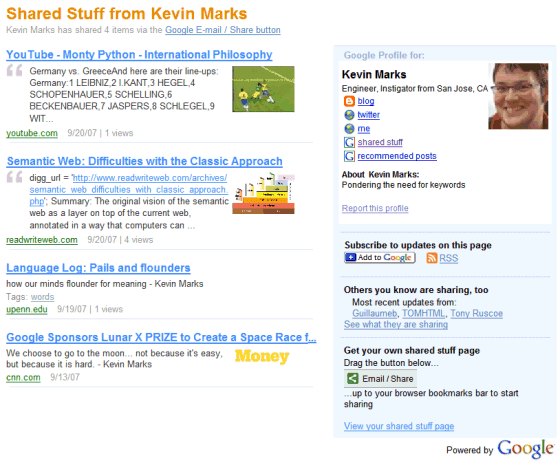 Here's the profile of Kevin Marks, a former Technorati engineer who now works at Google. You can also subscribe to feeds for all of these pages, but it would be nice to have a special feed for your contacts and gadget that keeps you up-to-date. Overall, the service adds the social component to Google Bookmarks and integrates a lot of ways to share content online. It will be interesting to see if Google manages to build a community around the new service and if you can rely on it to find and disseminate what's cool on the web. Google will probably allow you to add the "Share" button to your site so you can replace all the bookmarking/sharing buttons for del.icio.us, Digg, Facebook etc. and provide a better experience to your users. This is probably the first appearance of the Moka-Moka social project and Google will include shared information from other services (Picasa Web Albums, public events from your calendar, Google Reader's shared items or public Google Docs). But I don't use the browser bookmark bar, it's disabled. I only use the google bookmarks... How to add the button to the google toolbar ? You can't do that because it's not a button for Google Toolbar. Just right-click on the button and bookmark it. google services are great, but please mister goooogle just provide thight integration between your apps. this was a FF plugin until sometime back. This company is bought over by google I guess. I used that bookmarklet before but it was crashing my FF. Will find out soon. Just seems nutty not to have bookmarks and/or Google Reader capabilities built in. So Google's trying to catch up with the other bookmarking sites now? Kinda late to the ball. Thanks for the post. I checked this out. I liked the feature you didn't write about: besides sharing to Google Stuff, also be able to share stuff to del.icio.us and others in a few extra clicks. Refer to infoarch for more. I'd sure like to see a recommendation engine here. If they are down with integrating with Del.icio.us and Furl, I bet they could do some really awesome things in terms of cross service user and item recommendations. Also, I presume we can have cached copies of saved pages here. Lots of potential, for goodness sake. I second the integration notion. They have so many great products that are just waiting to be integrated with one another. I think perhaps one of the more interesting things here is the URL to the service. What's 's2' for instance? There are a number of sites out there that offer similar services. This one looks most similar to http://www.siphs.com, i.e. bookmark for yourself, share via email with others, and have a public place for people to browse your links. Nothing new, and better services do exist. This looks like an experiment that's somehow on live - for that's surely what it is? If it's not I'm a bit tired of Google rolling out half-baked products - I thought that they said they were going to finish off the products that they'd already launched? I couldn't get it to work with Firefox. First, I had to disable single window mode (TabMix Plus option) and allow pop-ups open in their own window. Once it popped up, it said transferring data from Google for over a minute, and was practically non-responsive. I gave up after that, but it looks pretty cool. I still miss the avalanche of product launches from 2005-2006, so any live experiment from Google is a great opportunity to see what they're up to. I remember that Larry Page or Sergey Brin said that Google needs to simplify the way you share stuff with other people. For example, Google Video, Picasa Web and Google Docs have different options and interfaces for sharing files. The new Share button could bring a common language across Google's properties and maybe other sites too. What a blatant Bzzster! ripoff! Yes, you're right. This thing is very similar to Bzzster (OK, maybe Google has a better name). There's also a bookmarklet, the dialog is similar, but Bzzster doesn't have an address book and a way to see shared pages from your contacts. Anyway, most social bookmarking sites have bookmarklets that trigger pop-up windows, so you can't say Bzzster invented this. Probably Google took some features from other bookmarking sites when designing this tool, but nobody claimed this is a big innovation. I just checked bzzster. This IS a blatant bzzster ripoff! it's horrible, why there is no button in Google Toolbar? It's a more mainstream service for people that don't really undersand stumbleupon or del.icio.us. I want to try this but for some reason when I use the google bookmarklet I can't post anything to the site... it just loads a blank page and nothing actually appears on my share site. Does anyone know what is going on and/or how to fix it? Another blank empty Tab here as well. I don't know what's the problem, but the bookmarklet/button only works in Internet Explorer and Opera. And in IE I had to whitelist google.com in the pop-up blocker. Interesting to note that the s2 name (in the Shared Stuff URL) was previously used as part of Google Base. Is this the umbrella for Google's Social strategy? I only wish that the shared stuff page would allow you to go back in & edit what you have posted ( spelling errors, etc... ). Also, when sending a link to others, it would be nice to have the bcc option. I'd also like to see shared stuff incorporated into the toolbar. The icon is standard for sharing web pages, the same as the orange icon for feeds. Share icon project - "a generic sharing icon that would be suitable for actions related to social bookmarking, memetrackers". The blank page happens when you have your browser set to open all new pages in new tabs instead of new windows. I for one will not be returning to multiple-window hell just to use Shared Stuff, but when they fix this glaring bug I look forward to trying it out. Thank you, Steven, you're genius. How did you figure out? there allways popup a complete new window (firefox), why is the new window not opened in a new tab? 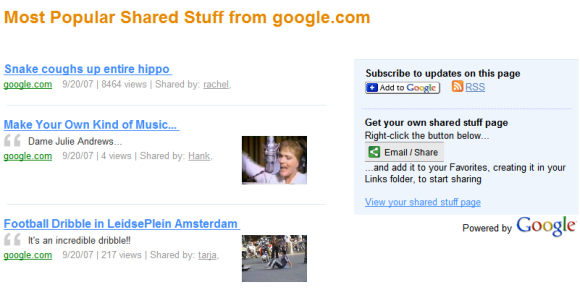 What's up with different results pages for Google Reader shared items and this Shared Stuff deal. What's the difference, or WHY the difference? Well, there's a small difference. 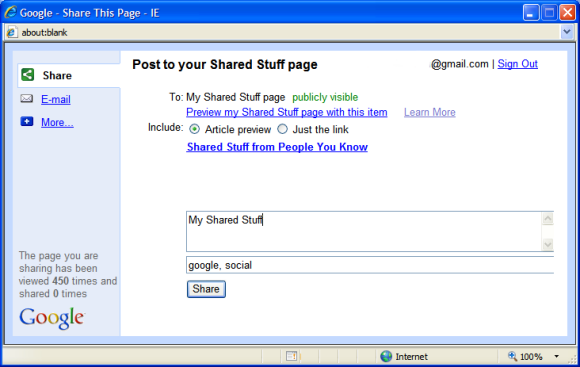 Shared Stuff lets you share any web page and add it to a public page. But it only adds the title, a small excerpt from the page, a thumbnail and your notes. Google Reader Shared Items lets you share a post, but only from the subscribed feeds. Google Reader adds the full content of the post to a public page. Maybe, at some point, Google will merge these public pages, but it's not that easy to find a way to display all these heterogeneous items on the same page. I'm not impressed with "Google Shared Stuff" at all. The service does not work with Firefox (or it did not for me.) I had to change my security setting in IE to low and still with it set low, it blocked several sites I was attempting to share. I then changed my setting to accept all cookies and it still would not work. Oh come on, Bzzzster didn't invent this, and there are several others out there. The thing that this does right is that it will grab a summary for you automatically (or not) and you can add your own comments too. If you then choose to Share this item in google reader your friends who subscribe to that feed will also get your commentary if you added it, which of course is half the point I think. Google fixed the Firefox bug. I think s2 = social sharing and Google Reader's shared items will be a part of it. is there a way to display more than 10 shared items? This is a great idea, but it needs some improvement. Where do the links prior to the last ten shared go? Why doesn't the email function work? None of my addressees have received the links I have forwarded using this tool. I would really like this feature if it actually worked. Keep it up, Google! I like so many of the other tools you've developed! WHY, WHY WHY after all this time, is there still no display for anything beyond the last ten (10)shared items??? Come ON already! Interestingly however, when you re-post something THE ORIGINAL COMMENTARY IS THERE AGAIN! Unfortunately, there is still no way to edit the comments on even the shared items that are still actually showing. Hey come ON Google, chop chop! I'll have to have a talk with my friend's tenant who is some little big shot at the company. You know what they say, once on Google, GMAIL or cached on the web, it's there FOREVER. I think it's confusing: there are share itmes in the google reader and a different shared stuff service. I guess Google is not so imppressive when it comes to social networking: no wonder google's orkut is outshadowed by facebook and linkedin. Shared Stuff do not work any more? the view count are based on what? Yes I got a error too. how to fix it? Seems to work OK in Firefox 3.0.5 but I agree that the opening in new windows is messy. Found this feature quite by chance and then had some difficulty finding any info about it (made the mistake of Googling for "Google share" rather than "Google sharing"). Baffling! Have just tried it again, to try sharing one of my public Google notebooks and it asked me to sign in to Google in French! Did that and I got another Google sign in redirect (pl - Polish?) but the page was blank. Checked the sharing preview and it was trying to share a site in a different tab in Firefox rather than the one with the Notebook open in it! The Shared Stuff link is very interesting. Google services are really great. How do I manage my shared page? What if I would like to delete an item? I just can't understand why there has to be two different "shared stuff" pages... one for Google Reader and one for items shared using this tool. Makes no sense. I am glad to talk with you and you give me great help! Thanks for that， I am wonderring if i can contact you via email when i meet problems?